The blog was originally published on ERPSoftwareBlog. B2B e-commerce is expected to reach $12 trillion in sales worldwide by 2020 (Source: Frost & Sullivan); the primary driver for the multi-fold growth projection in the world of B2B has been the growth of B2C e-commerce. With customers shopping on easy to navigate, personalize and convenient B2C e-commerce portals in their personal time, they have now come to expect the same when they go online to place orders during their business hours (B2B). This changing customer expectation has been driving the rush to adopt e-commerce everywhere. But most organizations fail to realize the true potential of their e-commerce store because they jump into things without truly assessing their situation and understanding how e-commerce can help them. In some cases businesses fail to even understand what they want to achieve from it. 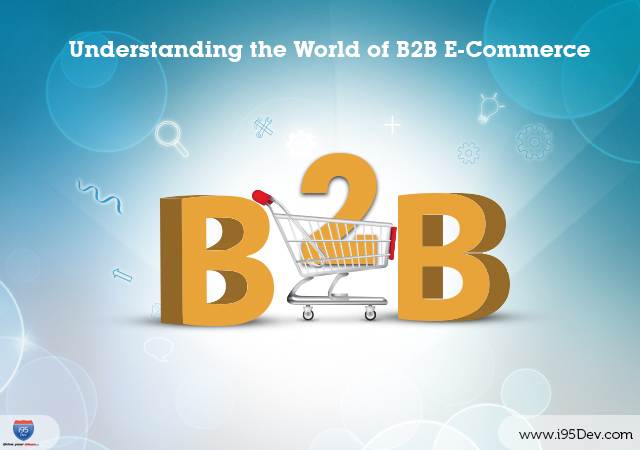 We will start our journey by understanding what B2B e-commerce is and what it is not. In the next few articles we will then explore the differences between B2B and B2C e-commerce, understand features that are critical and expected in the B2B e-commerce platform, look at some challenges which businesses face with B2B e-commerce adoption and conclude with possible ways to mitigate the adoption challenges. Before we get there let us visit the supply chain ecosystem which we will then use as a reference to facilitate better understanding. B2B (Business 2 Business) can be defined as a scenario where products and services are marketed and sold to other businesses whereas B2C (Business 2 Consumer) is where products and services are marketed and sold to end customers. In the image above the relationship between Supplier & Manufacturer, Manufacturer & Distributor and Distributor and Retailer can be considered B2B and the relationship between Retailer & End Customer as B2C. Though very basic it can be a little tricky to understand and appreciate this difference. This is because, a Manufacturer or Distributor selling directly to end customer can very easily be misunderstood for B2B (we have seen a number of instances where the moment you have a manufacturer or distributor selling a product it is assumed to be B2B and when you have a retailer selling a product it is assumed to be B2C). While similar there is a lot of difference between the two, because you might have a manufacturer and distributor directly selling to end customer (a possibility now because of emergence of a number of e-commerce platforms and even platforms like amazon, ebay, etc.). In that case it is a B2C transaction and not B2B. What do businesses want to accomplish? In the first scenario where businesses wish to adopt the e-commerce solution to bring in efficiency catering to their existing customers, you will require your e-commerce store to provide you feature like quotations and salesperson, allow purchase on credit, etc. Also, your distributors/ retailers will be more willing to cooperate with you in the e-commerce adoption. In the second scenario when you wish to adopt an e-commerce store to sell directly to your end customers the features you require will be entirely different. You will also face a lot of resistance internally for e-commerce adoption because this new channel will be perceived to eat into their commissions. Your Distributors, Resellers, Retailers and internal sales will feel left out because you can directly reach your end customers without their help. This does not end here; the other features and challenges you face in these two scenarios are very varied. Hence it is very important to understand the difference and identify the objective that you want to achieve. Also Read: Why e-commerce for Wholesalers, Distributors and Manufacturers? to understand why B2B businesses must adopt e-commerce. by i95Dev – Partner for your B2B and B2C e-commerce Needs.